Microangiopathic hemolytic anemia which is abbreviated as MAHA is a type of anemia. It occurs when erythrocytes get destructed because of physical shearing. Basically physical shearing occurs when microthrombi in systemic circulation blocks passage of small blood vessels. In microangiopathic hemolytic anemia, there is no problem in blood coagulation but thrombocytopenia accompany MAHA. Microangiopathic hemolytic anemia have two main prototype MAHA’s i.e. hemolytic uremic syndrome HUS and thrombotic thrombocytopenic purpura TTP. These two prototype continuum disease with different etiology insults. Microangiopathic hemolytic anemia have variety of etiological insults which may be inherited or acquired. But the common cause of microangiopathic hemolytic anemia is blockage of small vessels due to platelet plugging in systemic circulation. This platelet plugging leads to formation of microthrombi in various micro circulation of different vital organs. Shiga Toxin E.coli is responsible for causing hemolytic uremic syndrome. This toxin damages epithelial cells and results in platelet aggregation. Ultimately microthrombi deposition occur. There are various pathogens which are responsible for causing microangiopathic hemolytic anemia. Not only bacterias but drugs, inherited defects and malignancies may also cause microangiopathic hemolytic anemia. 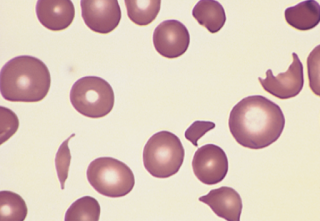 In diagnostic tests, platelet aggregation and thrombocytopenia confirms presence of microangiopathic hemolytic anemia. Microangiopathic hemolytic anemia is a type of anemia and its symptoms resembles all other types of anemia. Common symptoms include physical fatigue, the skin and eyes of patient show discoloration and turn yellow due to lack of oxygenated blood. Urine may also show discoloration and dark colored urine is observed. Physical examination of microangiopathic anemia shows jaundice and conjunctiva usually pale conjunctiva as symptom. When diagnostic results of microangiopathic hemolytic anemia are checked there will be anemia, increased concentration of indirect bilirubin, reticulocyte count increased, haptoglobin concentration decreased, lactate dehydrogenase also increased and increased concentration of urine urobilinogen. Causes of microangiopathic hemolytic anemia may be inherited or acquired. Basic etiology of microangiopathic hemolytic anemia is blockage of small vessels due to platelet aggregation and thrombocytopenia. If malignancy is the cause identified, then acute myeloid leukemia and mucinous adenocarcinomas may be responsible. During pregnancy, HELLP i.e. hemolysis, elevated liver enzyme and low platelet, placental abrasion and acute fatty liver during pregnancy may be responsible. Other causes include rheumatologic diseases and cardiovascular diseases. Microangiopathic hemolytic anemia may be drug induced and usually drugs involved are immunosuppressants and chemotherapeutic drugs. Other causes of microangiopathic hemolytic anemia involve march hemoglobinuria. Microangiopathic hemolytic anemia have two main prototypes i.e. hemolytic uremic syndrome HUS and thrombotic thrombocytopenic purpura TTP. So treatment is selected according to the type. Emergent plasma exchange is performed in case of TTP HUS. It is the 1st line therapy for TTP HUS. For typical HUS, therapy include hemodialysis. Antibiotics are used only when there are chances of sepsis. For thrombocytopenia, anti platelet therapy is recommended. 2nd line therapy involve plasma exchange twice or thrice a day.Corticosteroids are recommended with plasma exchange therapy. Rituximab is prescribed with or without cyclophosphamide.